Are there any pictures of these posters? I want to make sure that they exist and aren't just some crazy fanboy rumor. That is all part of the Easter eggs that have been woven into the story. Much like those Flight of Fear bulletin boards with news clippings. Those were not original, but showed up after a certain person started working in that area of the park. That person no longer works at the park (they used to post on here a lot, but I haven`t seen them recently). Kings Island knows how beloved and iconic Son of Beast was so they like to keep people thinking about it. I wouldn`t necessarily say it was a "beloved" ride. Yes, it was iconic. But it was not a ride that was very re-rideable. I would take Banshee any day over Son of Beast. I am sure the park didn`t care for the ride after all the money they sunk into it trying to make it an enjoyable ride. The pre-recorded spiel they had playing in the station even stated that "Son of Beast is a high speed, forceful, turbulent ride..." How often to you hear a safety warning discussing a ride as turbulent. I believe another park (might have been Hercules at Dorney) that had a sign that said to expect "intense ride jostling". Man, John Matarese has gotten lazy with his writing. Is that really news worthy? I've had work colleagues coming up to me telling me "Hey did ya hear Kings Island announced their new ride?" I'm like... "uhh... no. That's a fan submission. Very well done, but it's a fan submission..."
Social media has completely gone off the rails with false information and news. Although it is keeping the park in the buzz, so that's a plus for the PR group I guess! @RollerColt Yeah social media can be bad. Twitter is the worst. I dont even know how Im supposed to comprehend this tweet, let alone decipher it. Don makes his own blue ice cream hot cocoa is all I got from it. I am pretty sure Chad was just poking fun at John. I do not think there is a literal clue in that picture of a new ride. Video - what type or what kind? The fact that the screenshot used mirrors actual animation announcements means this was nothing more than a clickbait attempt. It’s the second time they came out with a Kings Island new coaster story that can’t be immediately proven. The problem is guests are falling for these stories. Yes, but the screenshot was formatted to look as if it was actual animation. WCPO reported on @RuthlessAirtime's creation and referenced this thread. Haha holy crap! Can’t believe they picked this up. Kinda flattered. 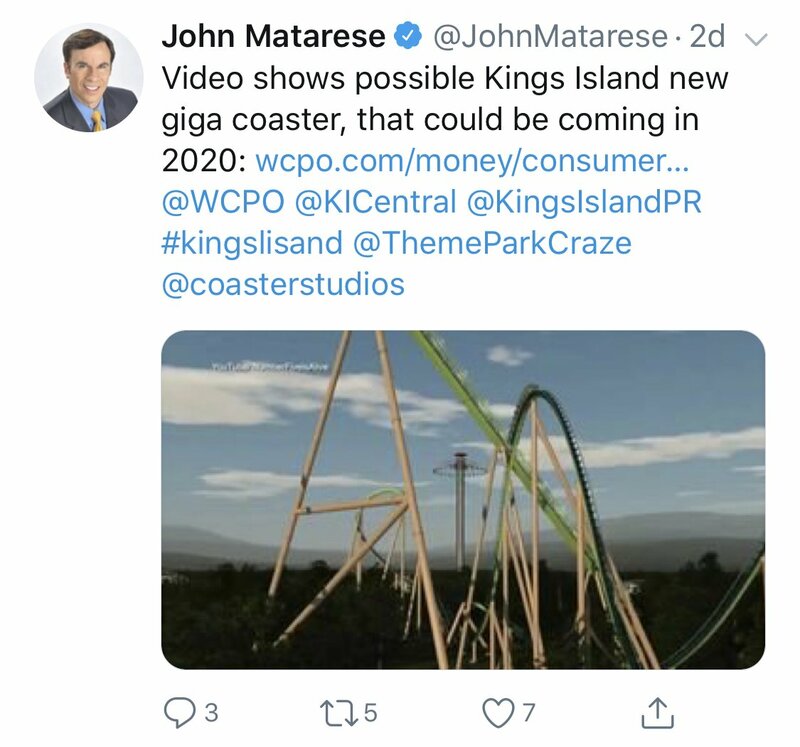 John Matarese seems like a big coaster nut, and I love it. Really like seeing the depth he’s going into regarding KI coaster projects, and I can’t wait to see him report on the official announcement of whatever ends up coming. Been kinda shocked at the reception to the concept I made. Glad people like it and happy to see it making the rounds. He addressed that it was fan made in the article. yeah the title is clickbaity but that’s what gets the views. I don’t think it’s a bad thing at all. If anything it should be showing KI just how badly everyone wants a giga. In a perfect world it would be nice if the rumor buzz was so relentless that building anything but a giga would be a mistake. Some people seem salty that @RuthlessAirtime got recognition instead of them. It's a bad look. Good job @RuthlessAirtime that was a cool concept you came up with. I don't know if it will be that tall, but I sure hope so!! Lol I’ve been getting some mild flame in the comments on YouTube for nit picky stuff people don’t like about it. Not really mad since that’s my first legit finished No Limits coaster. I’ve always been trash at it until I decided to really put the hours in for this one. That said, there are some buttmad enthusiasts in the comments that should just pony up and build something better if they don’t like what I’ve laid down. Sorry for triple post. Don’t know how or if I can quote multiple people in one response on here. 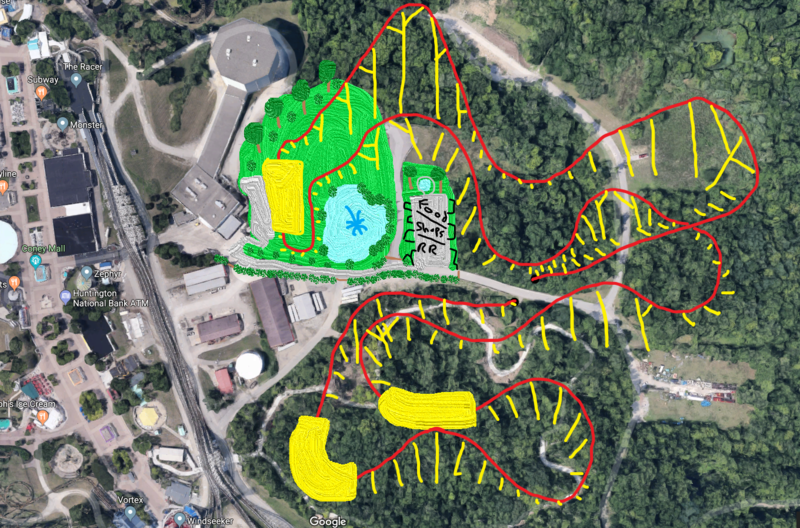 KI's GM Mike Koontz actually at coasterstock announced that he recommended to the board of Cedar Fair to invest in a giga coaster for Kings Island so they already do realize how good of a fit a giga would be. Hopefully Cedar Fair agrees. I am back with a concept. It may get old but oh well. I also know I have been lacking with them. Good job @Hawaiian Coasters 325 at keeping it going. So today I come with presents from Santa! I give you "Gargantuan". Also through in a little area with shade benches and shops/food. Double post....oh well lol This topic fell off big time! What's going on?! Yeah can’t wait for that thread!! I would think if the next Giga coaster is being built, there would be track at Clermont Steel by this point. Given the scale of the project. 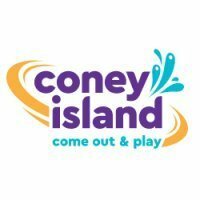 Has anyone driven by to see if there's any Hyper Coaster track at all? Track wouldn't need to be made that quick. B&M's go up pretty fast, even gigas. DB and Banshee track didn't show up until after their respective announcements and those 2 aren't slouches on size. If I recall correctly, Fury track didn't start showing up until March.